BACKGROUND EnterohaemorrhagicEscherichia coli (EHEC) constitute a significant risk to human health worldwide, and infections, particularly with serogroup O157:H7, are associated with consumption of a variety of food and water vehicles, particularly food of bovine origin. EHEC cause acute gastroenteritis, bloody diarrhoea, and haemorrhagic colitis; up to 10% of cases develop severe complications, including the haemolytic uraemic syndrome, with a 5% case fatality. A virulence characteristic of enteropathogenic E coli, the attaching/effacing lesion, is considered to be important in EHEC. However, although EHEC produce this lesion on cultured human cells, this has not been demonstrated on human intestinal mucosal surfaces. In addition, the initial site(s) of colonisation of EHEC in humans is not known. AIMS To assess the association of EHEC O157:H7 with paediatric and bovine intestine using in vitro organ culture and determine if attaching/effacing lesions occur. METHODS Ultrastructural analysis of in vitro intestinal organ cultures of human small and large intestine was used to investigate adhesion of O157:H7 EHEC to intestinal surfaces. Bovine intestinal organ culture was used to examine the pathology produced by the same EHEC strain in cattle. RESULTS The study showed that EHEC O157:H7 adhered to human intestinal mucosa. Binding and attaching/effacing lesion formation of O157:H7 in humans was restricted to follicle associated epithelium of Peyer's patches. The same strain caused attaching/effacing lesions on bovine mucosa. 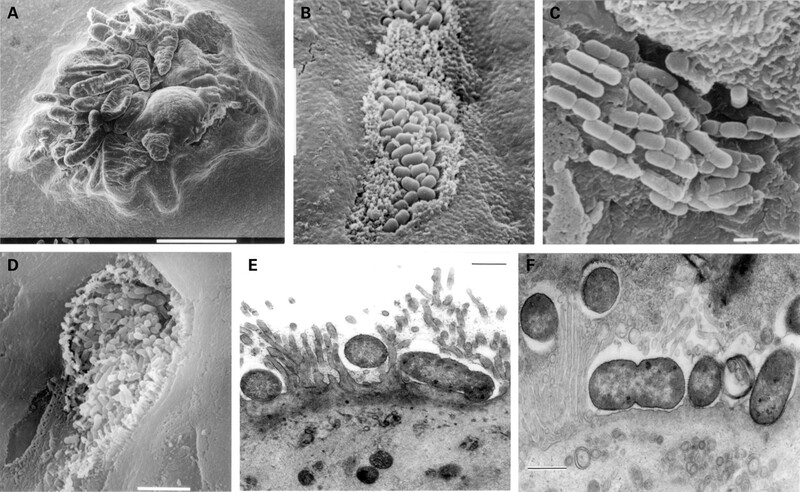 Although EHEC O157:H7 is believed to colonise the human large intestinal mucosa,1 association of EHEC O157:H7 and A/E lesion formation on human tissue has thus far not been demonstrated. In this in vitro study we investigated the interaction of EHEC O157:H7 with human mucosa and tested whether the same strain could cause A/E lesions on bovine intestinal mucosa. EPEC E2348/69 (O127:H6)25 and a spontaneous Stx negative derivative of EHEC 84-289 (O157:H7, termed 85-170)26 were used throughout. The EHEC strain was originally isolated from a food handler in a Canadian nursing home, is fluorescent actin staining test10 positive on cultured HEp-2 cells (data not shown), and expresses a surface located γ-type intimin. Bacteria were stored routinely at −70°C using a Microbank system (Prolab Diagnostics, Neston, UK). Prior to adhesion studies the strains were subcultured into brain heart infusion broth and incubated aerobically overnight at 37°C without agitation. After fully informed parental consent and local ethics committee approval, human tissue was obtained during routine investigation of patients for potential intestinal disorders. Proximal small intestinal mucosa (fourth part duodenum or duodenojejunal flexure) was taken using either a double port paediatric Crosby capsule or grasp biopsy forceps during upper endoscopy (Olympus PCF paediatric endoscope). These patients were being investigated for abdominal pain, chronic diarrhoea, and/or failure to thrive, but no gastrointestinal cause for their complaint was determined. Terminal ileum, Peyer's patches, and transverse colon were taken using the grasp biopsy method during routine lower endoscopy. Peyer's patches can be recognised and selectively biopsied during endoscopy,27 a technique made easier by the application of video endoscopy. Patients undergoing lower endoscopy either had no cause found for their presenting symptoms of abdominal pain and/or bloody diarrhoea or had inflammatory bowel disease or a polyp diagnosed, but no involvement of the region biopsied for this study was detected on gross or microscopic observation. Median age and age range of the patients are shown in table 1. All endoscopic biopsies were taken from areas showing no obvious pathology or other abnormality, and all intestinal histology was reported to be normal in the material used in this study. Bovine tissue was obtained from an adult Friesan cow undergoing routine slaughter at the Institute for Animal Health (Compton, Berkshire, UK). The cow had no recent history of diarrhoeal disease. A laparotomy was performed immediately after termination and a full thickness biopsy was taken from the continuous Peyer's patch region in the distal ileum and held at room temperature in in vitro organ culture (IVOC) medium28 for transportation to the laboratory. IVOC was performed as described previously28 for eight hours. Briefly, 25 μl of the overnight bacterial culture was inoculated onto the intestinal sample which had been placed mucosal surface up on a foam support in tissue culture medium (Dulbecco's modified Eagle's medium (with glucose and sodium bicarbonate), NCTC-135 (with l-glutamine), newborn calf serum, and 0.5% D-mannose (Sigma Chemical Co, Dorset, UK)). Each bacterial strain was examined in human IVOC on at least three occasions using tissue from different children. For bovine IVOC, three biopsies were used. An uninoculated specimen was included with each experimental culture to exclude the possibility of in vivo bacterial colonisation. After incubation, IVOC specimens were washed thoroughly three times with phosphate buffered saline to remove any non-adherent bacteria and then prepared for electron microscopy as described previously.28 Samples were fixed with 2.5% glutaraldehyde in 0.1 M phosphate buffer, post-fixed in 1% aqueous osmium tetroxide, and dehydrated in 2,2 dimethoxy-propane. For scanning electron microscopy (SEM), specimens were transferred to absolute ethanol, critically point dried using liquid carbon dioxide in an Emitech K850 apparatus, mounted on aluminium stubs, sputter coated with gold-palladium using a Polaron E5100 sputter coater, and viewed in a JEOL 5300 scanning EM at an accelerating voltage of 30 kV. For transmission electron microscopy (TEM), post-fixed specimens were dehydrated in 2,2-dimethoxypropane with three changes over nine minutes and embedded in TAAB resin (TAAB Laboratories, Reading, UK). Ultrathin sections (0.1 μm) were double stained with 2% uranyl acetate and lead citrate and examined in a JEOL 1200-EX II transmission electron microscope at an accelerating voltage of 80 kV. The interaction of EHEC strain 85-170 with freshly biopsied human tissues, obtained from different sites within the gut, was examined and compared with the prototype EPEC strain E2348/69. In human gut IVOC assays, the domed mucosal surface overlying individual lymphoid follicles within Peyer's patches can be easily recognised in the scanning EM (fig 1A) so that bacterial adhesion to follicle associated epithelium (FAE) can be discriminated from adhesion to other epithelial sites. EPEC strain E2348/69 adhered to IVOC prepared from proximal small intestine, distal small intestine, and FAE of Peyer's patches (fig 1B) but showed limited adhesion to colonic samples (table 1). A/E lesions were readily detected on IVOC samples infected with EPEC 2348/69 and the location of these lesions correlated with the adhesion pattern. In marked contrast, EHEC 85-170 were not detected adhering to the proximal small intestine, distal ileum, or transverse colon but were detected adhering to FAE in all Peyer's patch IVOC (fig 1C, D, table 1). Bacteria could not be detected adhering to the epithelium of villi neighbouring the follicle. Some bacterial colonies on FAE displayed a closely arranged parallel array of bacteria (fig 1C), although others were not as organised. Transmission EM identified A/E lesion formation in these regions (fig 1E). FAE associated adhesion appeared to be randomly scattered over the FAE, and definite examples of adhesion to M cells were not recognised. Indeed, M cells were infrequently detected by SEM. (A)–(E) are of human intestine. (A) In vitro organ culture (IVOC) sample showing presence of dome shaped lymphoid follicle (scanning electron microscopy (SEM); bar=500 μm). (B) Colony of EPEC E2348/69 on follicle associated epithelium (FAE) (SEM; bar=5 μm). (C) EHEC strain 85-170 adhering to FAE in “log-jam” pattern (SEM; bar=1 μm). (D) Colony of EHEC strain 85-170 on FAE (SEM; bar=5 μm). (E) Attaching/effacing lesion of EHEC strain 85-170 on FAE (transmission electron microscopy (TEM); bar=0.5 μm). (F) EHEC strain 85-170 showing attaching/effacing lesion on bovine ileum (TEM; bar=0.5 μm). As cattle are a known reservoir of human E coli O157 infection it was of interest to see if EHEC strain 85-170 could attach to bovine tissues and form A/E lesions similar to those seen in the human samples. The interaction of EHEC strain 85-170 with cattle tissues was examined using a mucosal sample taken from the continuous Peyer's patch region in the distal ileum and held at room temperature in IVOC medium for transportation to the laboratory. Bacteria were detected binding to the surface of the tissue by microscopy and formed typical A/E lesions (fig 1F). The target cells on the bovine mucosa to which the bacteria adhered could not be clearly identified, although the microvillous length suggested that they were absorptive epithelial cells. In the present study we have shown for the first time, using IVOC, that E coli O157:H7 can attach to and cause A/E lesions on human intestinal mucosal, and that the same strain causes A/E lesions in conventional adult cattle intestine. These novel observations provide a potential link between mechanisms of intestinal colonisation operating across the two species, a factor that may contribute to the interspecies spread of infection. The success in visualising these phenomena in human tissue is probably due to several factors, including the short term nature of the organ culture (eight hours), choice of Peyer's patch material, and absence of Stx encoding genes in the O157:H7 strain used. Under in vivo conditions, patients would only present when symptoms are well advanced and the effects of Stx (including epithelial destruction29) are apparent, thus precluding identification of bacterial adhesion and A/E lesion formation; postmortem material is inadequate for ultrastructural analysis of the surface epithelium. Using IVOC of human biopsies, we found that adhesion was limited to the FAE of Peyer's patches and that the pattern of adhesion showed similarities to the “log-jam” pattern described for O157:H7 in cell culture experiments.30 The apparent discrepancy between O157:H7 adhesion to HEp-2 cells but not to most human intestinal areas, is a previously reported phenomenon for several mutant EPEC strains which readily bind to HEp-2 cells but show no adhesion to paediatric intestine.28 This may result from the complex brush border in humans versus the morphologically simple microvillous-like processes seen on HEp-2 cells. Our initial studies in cattle served to demonstrate that a human isolate of O157:H7 could cause an A/E lesion in both species. Any comment on the pattern and sites of preferential adhesion in cattle would be premature and must await a more detailed investigation. Our observations with human IVOC parallel those obtained using a natural EPEC infection (strain RDEC-1) in rabbits. This strain initially colonises FAE of rabbit Peyer's patches and then spreads to other intestinal regions; there is a time lag of 6–7 days between inoculation and development of diarrhoea, with Peyer's patch colonisation occurring within 24 hours, and ileal and colonic colonisation following 2–3 days later.38 The incubation period for O157:H7 is similar at approximately seven days.39 We would conclude from our in vitro observations that colonisation of other intestinal regions by O157:H7 is a subsequent event following colonisation of FAE. Certainly, histological studies in humans show extensive damage to colonic mucosa in the form of a haemorrhagic colitis,40 although the relative contributions of Stx circulating within capillaries and bacteria adhering directly to the mucosal surface (causing A/E lesions and releasing toxin) in causing this damage is uncertain. The infective dose for O157:H7 can be small41 and this may appear surprising if the initial target of colonisation is restricted to FAE. However, Shigella species also have a small infective dose and show preferential adhesion to FAE of Peyer's patches.42 Both organisms are acid resistant,43 and this would assist passage through the stomach; growth would occur during transit to the ileocaecal region, where Peyer's patches are common, and reduced motility at the ileocaecal valve would also assist colonisation in this region. We could not unequivocally demonstrate EHEC O157:H7 binding to M cells as a potential mechanism for selective FAE binding in humans. However, recognition may be difficult as microvillous appearance is altered at sites of A/E lesion formation. M cells, unlike other epithelial cells, may express surface associated β-1 integrins36 (and possibly other integrins). Intimin, a protein essential forE coli O157:H7 colonisation in animal models,6 7 44 can bind β-1 integrins in vitro45 and thus could target EHEC to M cells. However, these cells were infrequently seen by SEM in FAE, a method routinely used to identify M cells, and a more formal study is needed to establish their frequency and relevance in humans. A particular intimin derivative, intimin γ, is associated with O157:H7 and related serotypes16; replacing the eaegene (encoding intimin γ) of O157:H7 witheae (encoding intimin α) results in colonisation spreading from the colon to the small intestine in gnotobiotic piglets.17 This raises the possibility that intimin γ, whether M cells are involved or not, mediates the preferential binding of O157:H7 to FAE of Peyer's patches, and studies pursuing this line of investigation are underway. We thank Jim Kaper and Stuart Knutton for providing strains, and Simon Murch and Mike Thomson for endoscopic skills in the provision of endoscopic biopsies, particularly from Peyer's patch areas. This work was supported by a joint BBSRC grant to ADP, TW, and GF. (1998) Diarrheagenic Escherichia coli. Clin Microbiol Rev 11:141–201. (1997) Escherichia coli O157:H7 diarrhea in the United States: clinical and epidemiologic features. Ann Intern Med 126:505–513. (1995) Escherichia coli O157:H7: clinical, diagnostic, and epidemiological aspects of human infection. Clin Infect Dis 20:1–10. (1983) Escherichia coli cytotoxin, haemolytic uraemic syndrome, and haemorrhagic colitis. Lancet ii:1299–1300. (1993) The role of the eae gene of enterohemorrhagic Escherichia coli in intimate attachment in vitro and in a porcine model. J Clin Invest 92:1418–1424. (1998) Escherichia coli O157:H7 requires intimin for enteropathogenicity in calves. Infect Immun 66:4560–4563. (1987) A DNA probe to identify enterohemorrhagic Escherichia coli of O157:H7 and other serotypes that cause hemorrhagic colitis and hemolytic uremic syndrome. J Infect Dis 156:175–182. (1993) The effect of enterohemorrhagic Escherichia coli O157:H7 on intestinal structure and solute transport in rabbits. Gastroenterology 104:467–474. (1989) Actin accumulation at sites of bacterial adhesion to tissue culture cells: basis of a new diagnostic test for enteropathogenic and enterohemorrhagic Escherichia coli. Infect Immun 57:1290–1298. (1986) Experimental infection of infant rabbits with verotoxin-producing Escherichia coli. Infect Immun 51:16–23. (1986) The pathogenesis of hemorrhagic colitis caused by Escherichia coli O157:H7 in gnotobiotic piglets. J Infect Dis 154:712–716. (1990) A genetic locus of enteropathogenic Escherichia coli necessary for the production of attaching effacing lesions on tissue culture cells. Proc Natl Acad Sci USA 87:2842–2844. (1992) Cloning and characterization of the eae gene of enterohemorrhagic Escherichia coli O157:H7. Mol Microbiol 6:411–417. (1996) Diarrhea in young children associated with Escherichia coli non-O157 organisms that produce Shiga-like toxin. J Pediatr 128:341–346. (1998) Detection of intimins α, β, γ, and δ, four intimin derivatives expressed by attaching and effacing microbial pathogens. J Clin Microbiol 36:662–668. (1995) The role of the eaeA gene in diarrhea and neurological complications in a gnotobiotic piglet model of enterohemorrhagic Escherichia coli infection. Infect Immun 63:3621–3627. (1998) Enteropathogenic and enterohemorrhagic Escherichia coli: more subversive elements. Mol Microbiol 30:911–921. (1999) The cloned locus of enterocyte effacement from enterohemorrhagic Escherichia coli O157:H7 is unable to confer the attaching effacing phenotype upon E coli K-12. Infect Immun 67:4260–4263. (1995) Signal transduction responses following adhesion of verocytotoxin-producing Escherichia coli. Infect Immun 63:3316–3326. (1997) A fifteen month study of Escherichia coli O157:H7 in a dairy herd. Epidemiol Infect 118:17–25. (1987) Cattle as reservoir of verotoxin-producing Escherichia coli O157:H7. Lancet 2:276. (1998) Isolation of E coli O157 from a calf with dysentery. Vet Rec 143:56. (1997) Experimental Escherichia coli O157:H7 carriage in calves. Appl Environ Microbiol 63:27–32. (1987) Role of a 60-megadalton plasmid and Shiga-like toxins in the pathogenesis of infection caused by enterohemorrhagic Escherichia coli O157:H7 in gnotobiotic piglets. Infect Immun 55:3117–3125. (1987) Selective biopsy of human Peyer's patches during ileal endoscopy. Gastroenterology 93:1356–1362. (1998) Role of intimin and bundle forming pili in enteropathogenic Escherichia coli adhesion to pediatric intestinal tissue in vitro. Infect Immun 66:1570–1578. (1986) Morphologic evaluation of the effects of shiga toxin and E coli shiga-like toxin on the rabbit intestine. Am J Pathol 125:69–80. (1995) Investigation of enterohemorrhagic Escherichia coli O157:H7 adherence characteristics and invasion potential reveals a new attachment pattern shared by intestinal E. coli. Infect Immun 63:2070–2074. (1998) Interactions of invasive pathogens Salmonella typhimurium, Listeria monocytogenes, and Shigella flexneri with M cells and murine Peyer's patches. Infect Immun 66:3758–3766. (1988) Vibrio cholerae O1 adherence to villi and lymphoid follicle epithelium: in vitro model using formalin-treated human small intestine and correlation between adherence and cell-associated hemagglutinin levels. Infect Immun 56:3241–3250. (1978) Bacteria on duodenal lymphoid follicle from child with diarrhoea. Lancet i:454. (1996) The lpf fimbrial operon mediates adhesion of Salmonella typhimurium to murine Peyer's patches. Proc Natl Acad Sci USA 93:279–283. (1997) Peyer's patch adherence of enteropathogenic Escherichia coli strains in rabbits. Infect Immun 65:3788–3793. (1998) M cell surface beta-1 integrin expression and invasin-mediated targeting of Yersinia pseudotuberculosis to mouse Peyer's patch M cells. Infect Immun 66:1237–1243. (1989) Production of diarrhea in the rabbit by a mutant of Escherichia coli (RDEC-1) that does not express adherence (AF/R1) pili. J Infect Dis 160:136–141. (1981) Diarrhea due to Escherichia coli strain RDEC-1 in the rabbit: the Peyer's patch as the initial site of attachment and colonization. J Infect Dis 143:440–446. (1986) Outbreak of gastrointestinal disease in Sarnia, Ontario. Ont Dis Surveill Rep 7:604–611. (1990) Escherichia coli 0157:H7-associated colitis. A clinical and histological study of 11 cases. Gastroenterology 99:142–149. (1996) Isolation of Escherichia coli O157 from raw meat products. Lett Appl Microbiol 23:317–321. (1996) Infection of rabbit Peyer's patches by Shigella flexneri: effect of adhesive or invasive bacterial phenotypes on follicle-associated epithelium. Infect Immun 64:2752–2764. (1995) Acid tolerance of enterohemorrhagic Escherichia coli. Appl Environ Microbiol 61:1669–1672. (1995) Enterohemorrhagic Escherichia coli O157:H7 requires intimin to colonize the gnotobiotic pig intestine and to adhere to HEp-2 cells. Infect Immun 63:3739–3744. (1996) The cell-binding domain of intimin from enteropathogenic Escherichia coli binds to beta1 integrins. J Biol Chem 271:20359–20364.